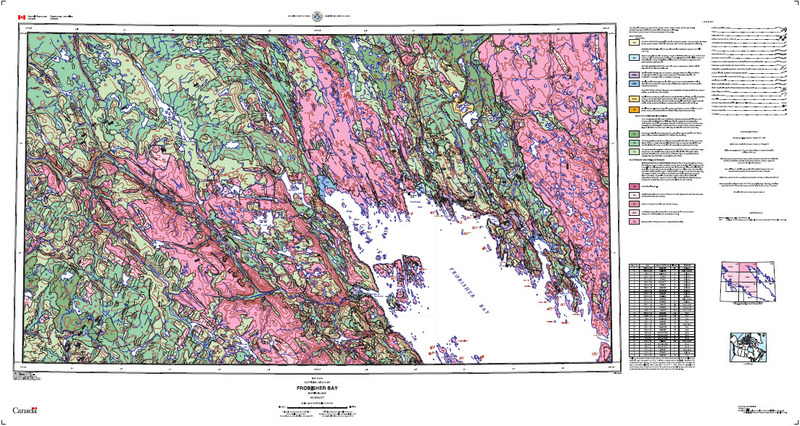 This surficial materials map is one of seven describing central and western Meta Incognita Peninsula as well as the head of Frobisher Bay, at the southeast extremity of Baffin Island. The communities of Iqaluit and Kimmirut lie within these seven maps. Weathered to unaltered rock is the most extensive surficial material; it is divided on the basis of decreasing susceptibility to weathering into five units. Mappable till covers a minority of the map area; elsewhere, pockets of thin till overlie bedrock. The single till unit is clast supported with an acidic silty sand matrix, though a silty matrix-supported till is discontinuously present on the southeast coast. Clasts are boulder and cobble Shield rocks of local origin. Thickest till is in the Frobisher Bay Moraine System (FBM) which is composed of multiple end moraine ridges on the flanks of Frobisher Bay (linear on the north side, where ice pushed upslope, convoluted on the south side in ridges and valleys) and a thick till belt farther west (looping down the regional slope). The area southeast of Markham Bay also has a thick till cover. Subglacial and proglacial aqueous deposits and landforms are prominent locally. The most common are sand and gravel subaerial glaciofluvial deposits concentrated in the FBM adjacent to Frobisher Bay; farther west, valley trains follow preglacial valleys to Hudson Strait. Raised glaciomarine deposits in the form of proglacial deltas are present where FBM intersects coasts (Frobisher and Markham bays) and where valley trains terminate. Thick, silty marine deposits are patchy around Frobisher Bay; on the southeast Hudson Strait coast calcareous silty till indicates source ice was in the strait. There is no terrestrial record of glaciers predating the last (Late Wisconsin) glaciation other than cirques. Striations, rock and till drumlins and till lineations indicate last glacial ice flowing from local, Foxe Ice Dome, down-Hudson Strait and cross-strait sources. The dominant flow was generally southeast across Baffin Island from the Foxe Ice Dome and this was also responsible for the late glacial readvance into the head of Frobisher Bay (to FBM).